PLUCK (USA) (Bay 2008-Stud 2012). 3 wins at 2, Breeders' Cup Juvenile Turf S., Gr.2. Sire of 151 rnrs, 76 wnrs, inc. SW Life on the Wire (TTC Vamos S., Gr.3), Aspect, Mongolian Wolf, SP Lucky Louie, Lady Pluck, Gasoline - Jade Theatre (H.K. ), Plucky Girl and of Cogliere, Awesome Pluck, Fionnlagh, Star Boy, All Pluck, Beyond Brave, Creidne, Happy Go Plucky, Harlem Child, Knysna Rose, Our Moon Shadow, Pluck That - Winwin Ruby (H.K. ), Pluckit, etc. Tumeke Bro (g by Mossman) Winner at 1500m, WATC Perth Racing TV P.
Jolen Jolen (f by Trusting) Winner at 2 in 2017-18 in Aust. Cornwall Coast (g by Duporth) Placed to 2017-18 in Aust. Speeding to Win. 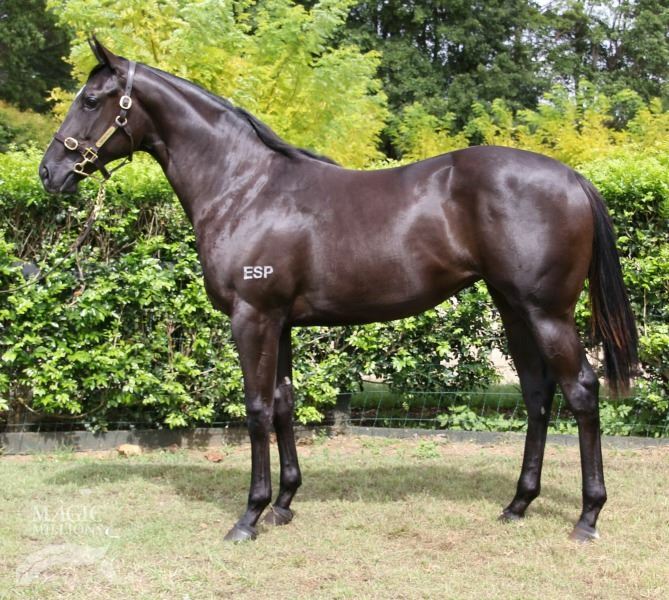 3 wins to 1200m, A$96,340, 2d AJC Merimbula Bay 2YO H., GCTC Magic Millions P., AJC Riverside H., Rosebery P., STC Hyland Race Colours P., 3d STC Freeway Hotel Artarmon P., Matrium Technologies H., Pool, Spa & Outdoor Living Expo P.
Lynlea's Lad. 3 wins-1 at 2-to 1400m, 2d MRC Over H.
Jiff. 7 wins to 1250m in Aust. Rio Bravo. 2 wins-1 at 2-at 1150m, 1200m in Aust. Silvery Sheila. Winner. See above. Gone on Sheila (f Gone West) 2 wins. See above. Gursky. 4 wins from 1800m to 2400m, 3d Deauville Prix de Feucherolles. OFFICE BEARER (c Officer) 5 wins to 1300m, A$299,500, MRC Bel Esprit S., L, ATC Cormack Packaging H., MVRC Adapt Australia H., MRC Mistable H., 2d VRC MSS Security Sprint H., L, MRC City of Greater Dandenong S., L, SAJC Redelva S., L, 3d VRC Dilmah Earl Grey S., L, SCTC Bribie H., L, MRC (Mornington) Sportingbet Protest Pay Up H., 4th BRC QTC Cup, Gr.2, VRC Bob Hoysted H., L, MRC Testa Rossa S., L.
Thelittleracketeer. 4 wins-1 at 2-to 1200m, A$105,285, ATC TAB Highway H., Professor Geoff McKellar Memorial H.
Sheilarized. 2 wins at 1400m, 1600m, ATC Quayclean H., 3d ATC TAB Rewards H.
Chico Lalo (c Until Sundown) 5 wins-1 at 2-from 1200m to 1600m in Chile, Hipodromo Chile Premio Bernardo Zegers Navarrete, 2d Hipodromo Chile Premio Que Mas Dá, 3d Hipodromo Chile Clasico Tanteo de Potrillos, Gr.1, 4th Hipodromo Chile Gran Criterium, Gr.1. SUPER SHEILA (f Last Tycoon) 5 wins. See above. Magikrem (c Seattle Song) 4 wins-2 at 2-from 1500m to 2000m, 3d Turin Premio Avvocato Amedeo Peyron, L.
STORMONT (c Marju) 3 wins-2 at 2-at 1200m in GB and Germany, Baden-Baden Goldene Peitsche, Gr.2, 2d York William Hill Trophy H., Newmarket Burwell S.
Stilett - Leeds (Mal.) (c Tirol) 4 wins from 1600m to 2000m in GB and Malaysia, Newmarket Amcor H., Penang TC Class 1 H., 2d Perak TC Coronation Cup, L, Selangor TC Dato' Sir Clough Thuraisingham Memorial Trophy, Class 1 H., 3d Selangor TC Otard Cup, Perak TC Class 1 H., 4th Selangor TC Tunku Gold Cup, L.